Hope you all had a wonderful holiday season and a safe and happy New Year celebration! I always love the beginning of the year. It's so full of hope! Do you have a word of the year? I shared mine yesterday. You can read about it here. And if you missed my favorite posts of 2013, you can find them here. As for my Frugal Round-up...because of all of my holiday frivolity for the past week, today I'm sharing just one post...but what a post it was! 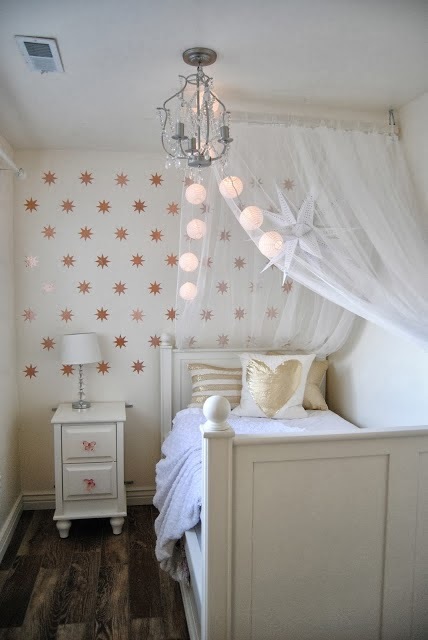 Visual Eye Candy shared her daughter's big girl bedroom and I'm in love! That wall! The Floor! Those pillows! It's no secret that I'm crushing on gold right now. And I think I could be perfectly happy in little Brynlee's big girl room. Lol! Thanks so much for another super party! :) Happy New Year! Happy New Year to you Wendy! Thanks for hosting and I look forward to more inspiration in 2014. Thank you for hosting the party. Happy New Year! Happy 2014 and many thanks for all the great link parties this past year! Hi Wendy! Thanks so much for hosting. So happy to be linking back up to your party after taking some time off to migrate my blog from Blogger to Wordpress. Happy new year! Happy New Year Wendy. Looking forward to the new projects you will share in 2014!